The game was five minutes old and the Bucs were already trailing. The Saints offense looked like a hot knife and the Bucs defense looked like butter. The 2018 season was barely underway, and the Bucs had already been punched in the nose. What happened next gave Tampa Bay fans an inkling of what the very near future might hold and plenty of hope that maybe, just maybe, things will be different this season. These didn't look like the same ol' Bucs, after all. Ryan Fitzpatrick dropped back to pass and fired a bomb to a wide-open DeSean Jackson. As the sprinting Jackson collected the ball for a 58-yard, take-that-Saints score that tied the game, you couldn't help but think: This is why Jackson is here. This is what an explosive offense looks like. This is how you win football games in the NFL. Then it kept happening. Again and again. Bomb after bomb after bomb. Boom. A 21-yard pass to Mike Evans. Boom. A 35-yard pass to O.J. Howard. Boom. Boom. Boom. A 32-yard pass to Evans. A 50-yard touchdown pass to Evans. A 36-yard touchdown to Jackson. Then another 35-yard completion to Jackson. Who were these guys? And when did an offense run by Fitzpatrick turn into the Greatest Show on Turf? 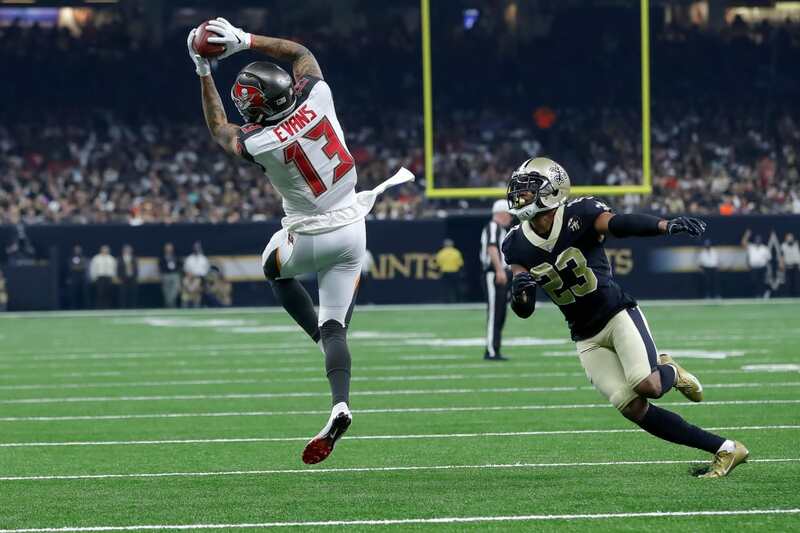 When it was over, the Bucs had lit up the scoreboard, turned out the Saints' lights and turned the normally deafening Superdome into a library. The offense amassed an astounding 529 yards. It tied a franchise record with 48 points. It should've cracked 50. Fitzpatrick threw for 417 yards and four touchdowns. He ran for another. For these explosive plays to work, everything has to go right on offense. The line must protect. The receivers must get open. The quarterback must spot them. Then he must deliver the ball and the receivers have to catch it. And all of those things happened. Time and time again, showing as much about this team's resilience as its skill. "Everybody's making plays,'' Evans said. Yes, there are some concerns. The injury bug has already bitten the Bucs with Jackson (concussion/shoulder) and Vernon Hargreaves (shoulder). And the defense, despite forcing two turnovers, has some shoring up to do in a hurry. But come on. This game went about as well as anyone in Tampa Bay could have hoped. It was auspicious if not expected. If you're the Bucs, how can you not be absolutely thrilled with what happened Sunday? Any win is a good win in the NFL, and this was a really good win. A division game. On the road. Against a Saints team everyone expects to be a Super Bowl contender. And they did it with an offense that looked scary good. They did it by winning the way really good teams win in the NFL. With one explosive offensive play after another. Boom.